Wendy has found a SUBSTITUTE MONKEY! 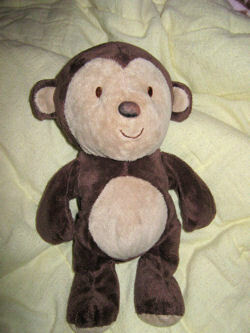 I have essentially replaced the Carter’s Monkey with Dangles, and my daughter loves him just fine. She is only 2 though, and not picky with her “Monkey” as it turns out. (Thank goodness!) I have purchased 2 back-ups of Dangles just in case they decide to discontinue him or something crazy! They were only about $10 each – and I found some on the shelf at the local Barnes & Noble Bookstore, as well. I think we are just fine with Dangles. Thank you for the wonderful service that you provide. You are much appreciated! For your information – Carter’s CHANGES their selections every 6 months! I’m feeling rather hopeless, as I see there are other people looking for the same little monkey I am. My daughter has become incredibly attached to a brown monkey. After never finding a back-up for my son’s lovey, I swore we’d never be in the same position with my daughter’s. I made sure I knew where I bought it and figured, since this was a Carter’s item, it would be easy to track down if she started to show a preference for it. Of course, now she is a year old, has just decided that she loves that thing like crazy, and I can’t find it anywhere!